We've been fighting for victims since 1985. If you become injured, how you let those moments define you is just as important as where you turn. One law firm for all your cases. Our Erie lawyers handle your entire personal injury case. Our Erie, PA Lawyers are unique in that we can handle every facet of your personal injury case. 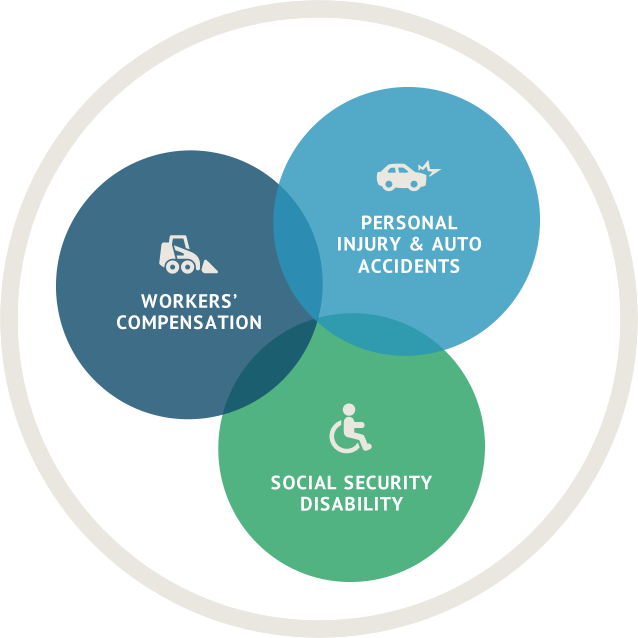 We represent injured victims of negligence with their Car Accident, Personal Injury, Workers’ Compensation, and Social Security Disability cases. More often than you might think, a significant injury requires legal experience in several or even all three of these areas of law at once. Rather than have three separate law firms handing each of your three injury cases, we do it all in-house from both our Erie, PA Office and our Smethport, PA Office. Call us for a Free Consultation to see for yourself why we’re the best lawyers for you and your family! There’s no fee unless there’s a recovery!